Embracing consumers shifting shopping habits from in-store to online. We built a multi-channel ecommerce platform with same day delivery capabilities to help Vomar maintain its competitive edge while capturing valuable data assets. 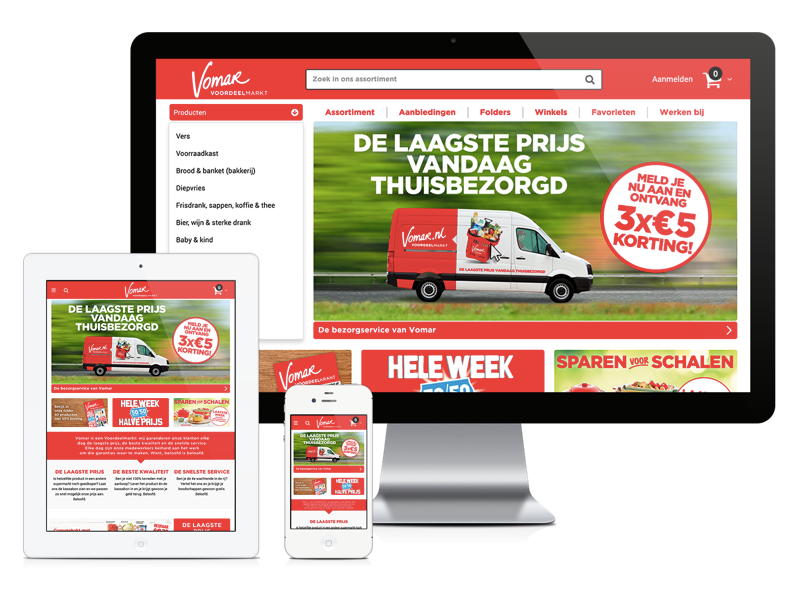 Vomar, a privately-owned Dutch discount supermarket chain and member of the Superunie cooperative purchasing union, is faced daily with the effects of the digital transformation. Its consumers are increasingly moving away from in-store shopping as online grocers and other non-traditional players enter the market to satisfy their desires. With an estimated 800,000 weekly customers across its 64 shops, Vomar sought to explore the possibilities of online grocery shopping and same day home delivery service to better align with its shoppers’ preferences. In doing so, it would extend its mission of delivering the best quality product against the lowest price to an innovative customer experience - including the same day home delivery. It would also capture valuable data assets on consumer behavior that would enable it to remain competitive despite the emergence of industry disruptors. Vomar decided to start with a pilot based upon its view that ecommerce is best scaled if the foundation is sound, and selected the city of Amsterdam for this effort. As Vomar had no ecommerce infrastructure to support online ordering or home delivery in place, the supermarket chain turned to Mobiquity for its digital engagement and data science expertise to see the pilot through. In response, Mobiquity designed and built the Home Shopping Platform (HSP), a centralized platform for all aspects of the ecommerce experience - from product and offer management to analytics and order fulfillment, and home delivery via Vomar's own fleet of vans. The HSP integrates with Vomar’s existing front and back-end IT environments and is fed with data from its current systems, accelerating time to market and ensuring that Vomar’s digital experience and in-store experience seamlessly connect. To enable consumers to shop, the HSP extends to multiple channels and endpoints across web, mobile (iOS and Android), and tablet to meet consumers' individual needs. We designed a user-friendly interface for each, allowing users to easily browse, select, and purchase groceries. In turn, Vomar not only provides convenient shopping options but also collects meaningful data assets that enable it to learn from customer behavior and personalize communications to drive brand loyalty. Yet digital ordering was only half of the value that Vomar was looking to bring to its consumers. It was also looking to provide home delivery service, the success of which depends on high order accuracy and fresh, high quality products. To support in-store fulfillment, Mobiquity designed and developed a mobile app for order pickers. The app uses barcode scanning to ensure order pickers are selecting the right products or the best alternatives when an item is unavailable. It has resulted in an error margin of just 0.05%. Customers score Vomar’s online grocery ordering and home delivery service an 8.5 out of 10, a true sign that it accomplished its objective of satisfying consumers’ shifting shopping habits. While the supermarket is currently determining its next step, it now has a solid foundation for its ecommerce program. It also has a means of collecting insightful data assets on consumers and the customer journey that it can leverage for its own benefit as well as share as a value-add with the companies that produce the products it sells. Wish to learn more? Please contact us.